The goal for the event is to raise $50,000 for Magen David Adom and its team of volunteer and professional medical responders to provide Sderot with emergency medical services such as ambulances. 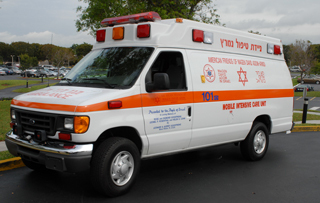 Israeli ambulance drivers can look forward to an army of Jewish motorcyclists riding to the rescue, financially speaking, 5,600 miles to the west on June 14. Many of these kosher bikers will literally wander into Newtown to participate in a fundraiser aimed at raising $50,000 for Magen David Adom, the ambulance corps which provides Sderot with medical, disaster, ambulance and blood-supply services. "We are specifically raising money for Sderot," said Mark Melmed of Holland, who heads the Bucks County Friends of AFMDA. "All proceeds will go directly to our AFMDA fund-raising efforts to save lives in Israel." The money they want to raise on June 14 is half the $100,000 they seek in combination with smaller events throughout the year, Melmed said. The money is earmarked to train 30 first-responders and purchase a defibrillator, he added. Sderot is the small city next to the Gaza border which has been subject to rocket attacks in recent years. The Star of David Bikers are a motorcycle organization based in the Delaware Valley. The members of the organization share a passion for motorcycles and a love of the Jewish people. 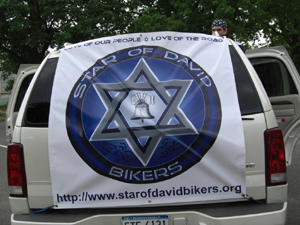 AFMDA's Bucks County chapter will partner with Star of David Bikers to sponsor the Star to Star Ride and Motorcycle Show. The Philadelphia-based Star of David Bikers will host motorcycle groups from New York to Virginia that belong to the Jewish Motorcycle Alliance. "We are expecting the motorcyclists from our community to be joined by neighboring riding clubs from Virginia, Maryland, New Jersey, New York and even further away," Bikers president Louis Nemtsov of Churchville wrote in a news release. "This will be one event you will not want to miss." The two-pronged event will begin with a motorcycle ride through Bucks County as the bikers will meet at Shir Ami synagogue, 101 Richboro Road, at 10 a.m. and return at noon to the synagogue, Nemtsov said. The motorcycle ride will be followed by a program for the general public to include a motorcycle showcase, a best motorcycle judging competition, live music, food, drinks, games, prizes and more. It will continue until 5 p.m. Attendance will be free of charge, but the bikers will be charged to participate and the organizers will sell T-shirts, food, games for children and raffles, Melmed said. Of course, donations will be accepted, he added. Melmed, 63, a retired software engineer, said 200 bikers are expected to participate. Planning for the event, which will be a first, developed after AFMDA's regional director for Philadelphia, Sharon Schmidt, met some Jewish motorcyclists at a Jewish festival in Bucks County, Melmed recalled. "It has never been done before," he said of the June 14 event. Nemtsov, 44, of Churchville, who emigrated from the former Soviet Union as a child, said the motorcycle clubs will include The Tribe from Maryland and Virginia; Chai Riders of New York; and Hillel's Angels of New Jersey.